Shola Walker makes sweets you never knew you needed. Shola Walker stood in front of the dining room, feet planted, echoes of a dancer’s posture settling around her shoulders. A sea of faces turned towards hers as elegant slices of cake landed before them. 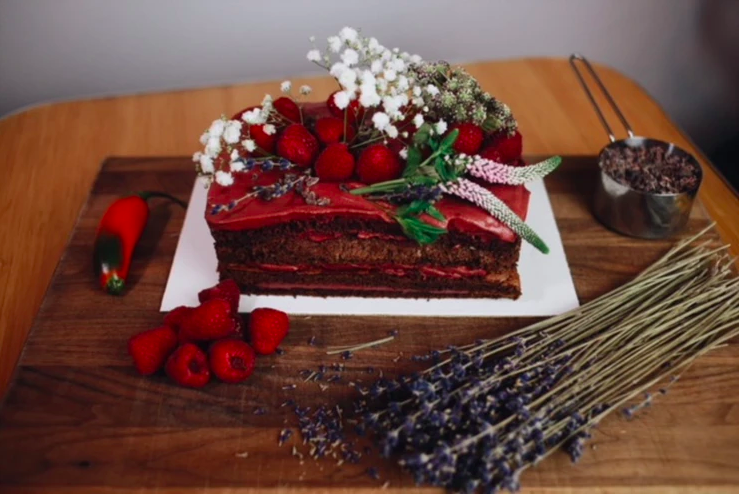 Elsewhere, she'd dubbed this the Phoenix cake—a chocolate roulade with a jalapeño raspberry mousse—but tonight, she only told the crowd that the dessert was in response to a disheartening, life-changing bit of news she’d received recently. It was a reactionary piece, she said, the sweet mingling with the sour of life, with its underlying heat. Gazes returned to the plates, the cake magically having taken on a kind of spiritual weight they couldn’t see before. 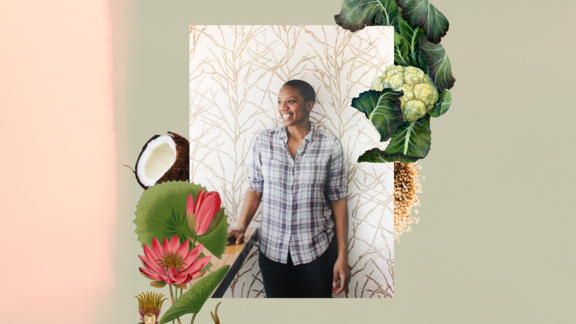 Walker opened Mahogany Sweets in Richmond, VA with her sisters in 2017, winning the hearts of die-hard dessert enthusiasts with gluten-free and vegan confections. They’re low-glycemic, earth-friendly, and captivating proofs of what dessert could (and perhaps should) be. “In 2011, I suffered the first significant blow to my health,” Walker wrote on the bakery’s blog. “It was discovered that I had fibroid tumors […] being inflamed by gluten. This is impossible, I thought—I make bread, I love bread, and now the main component in it is my biggest enemy.” In 2016, she began showing signs of an autoimmune condition, and her regimen became dairy-free as well. In 2018, after years of careful dedication, her doctor found abnormal cells. It felt like betrayal. The jalapeño, for me, was directly related to me finding out that I had abnormal cells two days before my 36th birthday. For about two weeks after, it was like I was walking through a fog. I could not figure out how to get out of it. I'm a determined person. I like to get things done. [But] my doctor was telling me, "There's really nothing you can do, other than wait." That's where the jalapeño came from: I had to figure out a way to make my anger, my disappointment, all of those things, tangible. Baking is really the only way I know how to do that. There was another cake that I called The Langston Blues, which had blackberries and blueberries in it. The icing kind of dripped off of the side like tears. It’s all part of the process for me. [Cooking this way] has changed how I am in the world. It forced me to understand patience. Patience not only with the process but with people. Lots of people wonder why you don’t just do what everyone else has always done, and and I get that. People get used to things. But you have to step beyond the norm, beyond your fear, to see that people are trying to live their best lives. And part of living their best lives is taking control of their health. So maybe that means they use coconut sugar so they can keep their glycemic index down. Or maybe they don't eat animals because they can get protein from other sources. Maybe it means they’re gluten-free. And it's all okay. It doesn't really matter how you take care of your health—what matters is that you do. That's one thing that I want people to know. You don't necessarily have to do it my way, you know? I think what's missing, in my opinion, is our connection; a lot of people walk into a bakery and expect things to be chocolate. They're expecting things to have fruit in them all year round. But cocoa does not grow in the United States, and it never has. You know what else is an option? Pawpaw, which grows in Virginia in late summer into the fall. They're sweet and delicious and there are lots of things that you can do with them, but we’ve forgotten because we're so used to chocolate. If we pay more attention to our surroundings, then perhaps our tastes and desires would change. We use a considerable amount of coconut oil at the bakery, but I try my hardest to make sure our coconut oil is ethically sourced. For the health benefits, but also because I'm borrowing this from another country, you know? It’s all very intentional. I use a lot of sunflower seeds because it's a seed that isn’t too strong [and] has a flavor that translates into other desserts, but also because when my sisters and I were little kids, we’d go on summer road trips with my dad and eat a lot of sunflower seeds. I use a lot of sesame because there's a strain of sesame seeds that grew in West Africa. It's me tipping my hat to my ancestors, [who] gave me the opportunity to do this. Our chocolate torte is my crown jewel because people eat it and they love it, and they never question what's in it, which I'm very proud of. The moment I get to tell them this is cauliflower and it's made with coconut sugar, so it's also low glycemic, makes my day. I think that’s why a lot of people come back. It has always been a part of my personal story to be healthy. Being a Southerner [means that] for the last 15 years, I have had a very different relationship with traditional Southern comfort food. Macaroni and cheese is great. It is delicious. But at this junction in my life, I can have neither the mac nor the cheese. What makes me feel comfortable are things that feel good to me. I find comfort in that. I particularly enjoy when I can do the same thing for other people. We only get one body, right? And I intend to have this body as long as life allows. I intend to use it in the best way possible. I don't want to just run it into the ground; if I can live a good life and live a healthy life, I'd rather do that. Organic food, and especially gluten-free food, is expensive. It just is. We are not at a place in society yet where healthier food options are not expensive. But I’d rather pay for it in the food that I eat, than in the medications that I take. It’s important to me that people know their health matters. There's nothing selfish about it at all. For industry advocate and prolific bartender Ashtin Berry, mental health starts with open communication. Chef Aaron Adams of Farm Spirit in PDX considers the state of things. A personal cooking challenge delivers a much bigger lesson in compassion. Crank it up, make muffins. An interview with the cookbook author right before her game-changing Netflix show captures your squishy little heart. See how chef Gregory Gourdet did it, then get fired up about charging the hills.